A few years ago, I put a notice in this blog about a colleague's interesting use of Google Docs to share terminology with faraway colleagues in a project. Earlier this year I enjoyed a similar collaboration with a Google Docs spreadsheet used to exchange and update terminology on a very time-critical annual report with translators using two different versions of Trados, memoQ and no CAT tools at all. Sharing information via Google Docs was quite easy, and we were able to configure the access rights without a lot of trouble. But at the time I still had a bit of extra, annoying effort to get the data imported into my working environment for frequent updates. Tonight another colleague contacted me with basically the same problem. Her client manages data in an Excel spreadsheet, which gets updated and sent out frequently. She already had the idea that this might work better in Google Docs, and I agreed. I've marked a few of the export ("download") formats which are probably useful for a subsequent import into a translation environment too. But the downloaded data still won't be in the "perfect" format in many cases, and there will be extra steps involved in matching it up to the fields in your term base. One way to simplify this problem is to create another online spreadsheet in Google Docs and link it to the original, shared spreadsheet. In this second spreadsheet, which is your "personal" copy for use in your favorite tool, you reformat the data so they will export in a form that makes your later import to your tool's termbase easier. I linked the columns in my personal online spreadsheet with the shared spreadsheet using the ImportRange command. It has two arguments, both of which have to enclosed in quotes. The first one (argument #1 above) is the key for the online spreadsheet to be referenced; it is shown in the URL of the online spreadsheet (just look in the address bar of your browser and you will see it). The second one specifies the sheet and the range of cells to copy. I put this formula in one cell and it copied the entire column for me. I could, if I wanted to, use conditional (IF) statements and other tricks to transform some data in columns of the other sheet and build the semicolon-delimited term properties list (Term_Info) that memoQ uses to keep track of gender, capitalization enforcement, forbidden status, etc. But none of that is needed for simple sharing of terms, definitions and examples for instance. 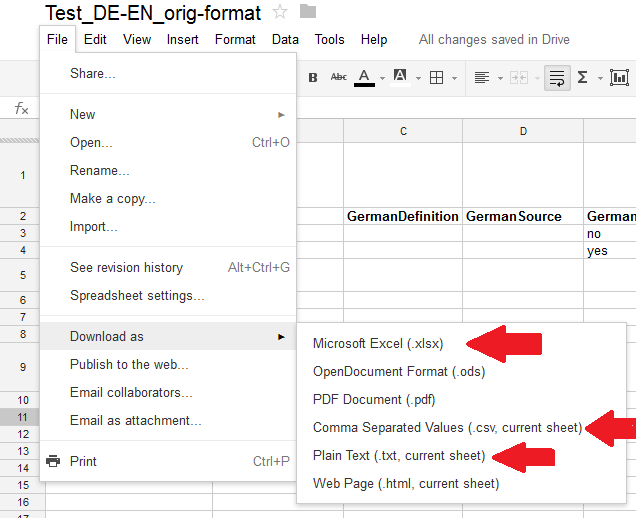 I simply export my personal Google Docs spreadshit as CSV, then import it into my desired termbase in memoQ. If I have IDs set for the term entries in the online spreadsheet, I could even choose ID-based updates of my local termbase when I do the import. Those who use other tools, such as Trados, OmegaT or WordFast can set up their spreadsheets and do exports as best suits their needs. This approach enables you to take source data in nearly any format in an online spreadsheet and rework it for the greatest convenience in the tool of your choice. Although not a "perfect" solution, it is perhaps a convenient one until better resources are commonly available for dynamic, cross-platform translation collaboration. So what do I recommend my friend to try as a first step? Maybe take the client's latest spreadsheet, copy and paste it into Google Docs and share it with the client and others on the team. Then it's already "up there" for everyone's convenience (local XLSX copies can be downloaded any time), and she can get on with creating a convenient "view" of this shared data in her personal spreadsheet, which can be exported for local use any time. That personal sheet could also be shared (read only access recommended) with other team members using the same translation environment tool. Surely, Rob. I must be missing my farming days in Oregon, when I used to spread the manure from my sheep, chickns, horse and donkeys on the gardens. Time to go muck out the pigeon coop I suppose. I also used google docs document for the translation project. 30 students collaborated in a 226 page document. It provides a great ammount of data to be analysed regarding the translation and collaboration process. Nice post, I like the idea of a transitional spreadsheet, may try it sometime.